The Australian Electoral Commission will this week be sending text messages, emails and letters to almost half a million unenrolled Australians reminding them to join their fellow Australians on the electoral roll ahead of this year’s federal election. Electoral Commissioner, Mr Tom Rogers said a record 16.2 million people – an estimated 96.3 per cent of eligible Australians – were currently on the roll in what is already the largest and best enrolment rate in Australian history. “We’ve worked very hard in recent years to increase the enrolment rate and it’s terrific to see the electoral roll in excellent shape ahead of this year’s federal election,” he said. “In the past decade we’ve witnessed massive and unprecedented growth – with the enrolment rate rising from 90.9 per cent at the 2010 federal election. 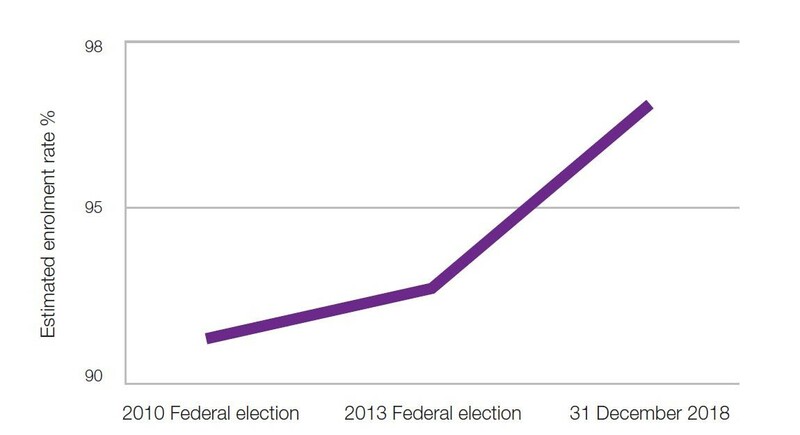 Mr Rogers said that each federal election the AEC processes hundreds of thousands of enrolment transactions in the week leading up to the enrolment deadline. “We are very confident that, for the upcoming federal election, our enrolment efforts throughout the electoral cycle combined with upcoming AEC communication will produce the most complete and accurate roll Australia has ever had,” Mr Rogers said. “We remain committed to the full electoral participation of all eligible Australians, no matter where they live. “Enrolment is not only about being on the roll, it is about being enrolled at your current residential address. Go to www.aec.gov.au to enrol or update your details now. For the most recent federal election, in July 2016, the AEC added in excess of 132,000 people to the roll in the period immediately before the close of rolls and carried out 687,000 enrolment transactions. 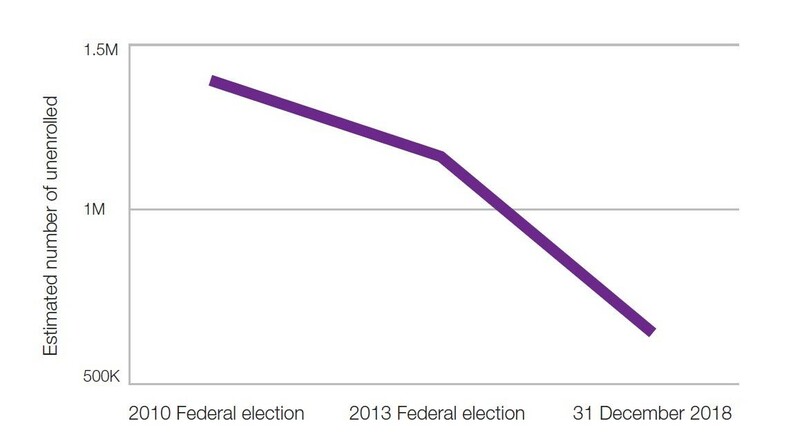 The number of unenrolled Australians is represented in the graph below.